Canadian driver Robert Wickens was involved in a scary crash at Pocono on Sunday. Verizon IndyCar Series rookie Robert Wickens reportedly was “awake and alert” in an Allentown, Pa., hospital Sunday after triggering a violent, multi-car crash in the ABC Supply 500 at Pocono Raceway. The right front tire of Wickens’ No. 6 Honda made contact with the left rear tire of Hunter-Reay’s No. 28 Honda, launching Wickens’ car up the white Safer Barrier wall and into the catch-fence. Wickens’car pin-wheeled along the fence before slamming to the pavement right-side-up and sliding to a halt along the inside pit wall. INDYCAR’s Holmatro Safety Team approximately needed 12 minutes to extricate WIckens, 29, from the wreckage and place him into an ambulance for a check-up in the track’s infield care center. The crash also collected the cars of James Hinchcliffe, Wickens’ teammate and fellow-Canadian; rookie Pietro Fittipaldi and 2017 Indy 500 winner Takuma Sato. An Indy car rookie but an experienced international road-racer, Wickens began the event sixth in the 22-car field. 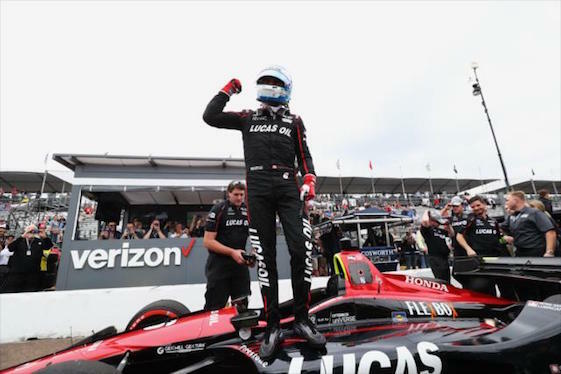 Wickens had posted one pole position and seven top-five results in the season’s first 13 races. His ninth-place finish in the 102nd Indianapolis 500 in May earned him Rookie of the Year honors. Curt Cavin, vice president of communications for INDYCAR, reported on Wickens’ condition during an interview on NBC Sports Network. Wickens was taken by helicopter to Lehigh Valley-Cedar Crest Hospital in Allentown. No updates were made available as the race wound down to its final laps with Alexander Rossi of Andretti Autosport leading pole-sitter Will Power, the reigning Indy 500 champion, of Team Penske. Rossi, driver of the No. 27 NAPA Auto Parts Honda, prevailed over Power with Dixon finishing third. Rossi, who also won the previous race at Mid-Ohio Sports Car Course, pulled to within 29 points of Dixon with three races remaining on the schedule. Rossi, who won the 100th Indy 500 as an oval track rookie, has three wins this season. Fittipaldi and Hinchcliffe were released from the infield medical center about one-half hour after the crash. Hunter-Reay and Sato also were released from the center shortly after the crash. It took the track’s crew approximately two hours to repair the catch-fence and clean up the debris field of parts from Wickens’ destroyed Dallara chassis. Verizon IndyCar Series point standings: Dixon 530, Rossi 501, Newgarden 464, Power 449, Hunter-Reay 411, Wickens 391, Pagenaud 368, Rahal 351, Hinchcliffe 338, Bourdais 325.